At various times throughout our pilgrimage, we are blessed with the incredible opportunity to spend time with local women who will share their stories with us. Days and locations are based on their availability. We start our pilgrimage with an overnight flight to Tel Aviv. Meals and beverages will be served in flight. We arrive at the Ben Gurion Airport and are met by or friendly Pathfinders representative who take us to our motor coach. We arrive in Jaffa for a stroll through the Artists Quarter. In Jaffa we will hear the story of Tabitha, who was revived by St. Peter. We continue on to the beautiful Mediterranean sea for the evening. Dinner and overnight in Netanya. Our pilgrimage begins today as we travel to Caesarea where it was revealed to St. Peter that the Good News was intended not just for the Jewish people but the entire world! We visit the aqueduct, ancient Herodian Harbor and the remains of the seaside palace of Pontius Pilate. We continue on to Stella Maris, a Carmelite Monastery located above the cave where the prophet Elijah once lived. We will see the site where Deborah led the battle of the Waters of Megiddo. 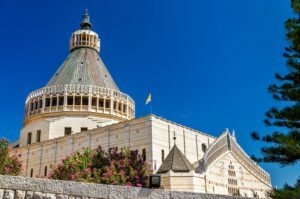 We then journey into Nazareth where we visit the Church of the Annunciation, where the Angel Gabriel appeared to Mary, and view the remains of the town of Nazareth, the home of the Holy Family. We continue on to Cana where we visit the Church of the Wedding at Cana and then head to the Sea of Galilee. Dinner and overnight near the Sea of Galilee. We begin today at the Mount of Beatitudes where Jesus gave us the new commandments. We then journey to Tabgha to visit the Church of Loaves and Fishes and the Church of the Primacy of Peter. Upon arrival in Capernum we visit the house of Peter, where Jesus healed his mother-in-law and the synagogue where Jesus preached and cast out demons. 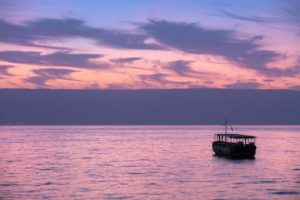 Our day ends as we board a wooden boat for a sunset sail on the Sea of Galilee. Dinner and overnight near the Sea of Galilee. Today we begin with a hike in the Upper Jordan Valley to view the ancient ruins where King Jeroboam erected a golden calf. We continue on to the foothills of Mt. Hermon, the headwaters of the Jordan at Banias- Caesarea Philippi, where Peter acknowledged Jesus as Christ. We continue on to the top of the Golan Heights and look out on the road to Damascus. Then we visit the remains of Gergesa, where Jesus drove the evil spirits out of the possessed man. We return to our lodging for a afternoon at leisure. After dinner there is an opportunity to tour a diamond and jewelry factory in Tiberias. Dinner and overnight near the Sea of Galilee. Our pilgrimage today begins at the Tomb of Rachel the Poetess. Next we journey to the world’s oldest city, Jericho, where we climb the Tel to view the ancient towers of the Mount of Temptation. Continuing on through Qumran, we take the opportunity to tour the Ahava cosmetic factory. We then journey to the Dead Sea where we check into our hotel. 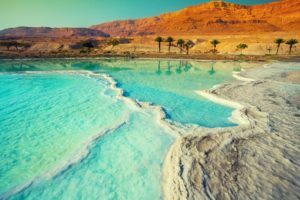 Upon arrival enjoy a float in the dead sea or a mud bath, or even a soak in the hot mineral water at the spa. Dinner and overnight near the Dead Sea. Today we take a cable car to the top of the fortress of Masada followed by a stroll through Ein Gedi Nature Preserve. We will visit the Pillar of Lot’s Wife before making our way back to our lodging for a self-directed afternoon retreat. Overnight near Dead Sea. 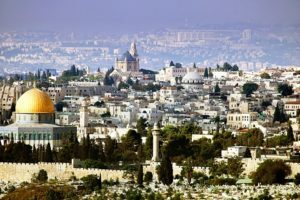 We journey today to Jerusalem where we make our way to the Mount of Olives and we get our first look at the Holy City as we walk the Palm Sunday Road to the Church of Dominus Flevit. We then travel to Mount Zion and the Church of St. Peter in Gallicantu, continuing on to the Upper Room. Our last stop today is at the Church of Dormition, which commemorates the Assumption of the Virigin Mary, and view the mosaics depicting the Women of Faith in the Old and New Testaments. Dinner and overnight in Jerusalem. We journey this morning to Bethlehem, “the city of bread,” and visit the Holy Child Program (www.holychildbethlehem.org), which serves Christian and Muslim children with special needs. 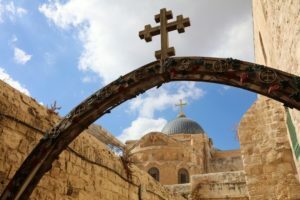 We continue to meet local Palestinian Christians and Muslims at Bethlehem University and enjoy lunch served by students of the Culinary Arts Programs.We then visit the Church of the Nativity and the Shepherds’ Fields. 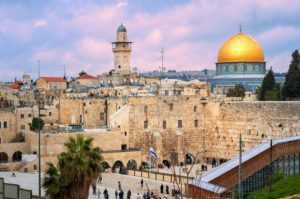 We return to Jerusalem where we visit the Old City and the Western (Wailing) Wall, the remains of the temple where Jesus preached. This evening we attend the Tower of David Night Spectacular Show. Dinner and Overnight in Jerusalem. We begin early today as we visit the Crusader Church of St. Anne and the Pools of Bethesda. Then experience the most significant journey of our faith, the Via Dolorosa (Stations of the Cross). We make our way to the Church of the Holy Sepulchre, where we celebrate Mass. The rest of the afternoon is at leisure. This evening we have a special farewell dinner to celebrate the conclusion of our pilgrimage. Dinner and Overnight in Jerusalem.